Makey Christmas and a Hacky New Year! Our homes are full of technology that we typically take for granted and understand little. Your average smartphone or tablet, for example, is a “black box”, that deliberately discourages modification by tinkering and hacking. This Christmas, Danielle George takes three technologies we routinely take for granted – the light bulb, the telephone and the motor – and shows you how to hack your home as part of the Royal Institution Christmas Lectures broadcast on BBC Four. Inspired by Geordie inventor Joseph Swan, Danielle attempts to play a computer game on the windows of a skyscraper using hundreds of light bulbs. Along the way, Danielle will show the next generation how to hack, adapt and transform the technologies found in the home to have fun and make a difference to the world. This year’s Royal Institution Christmas Lectures have been inspired by the great inventors and the thousands of people playing with technology at their kitchen tables or tinkering in their garden sheds. When Joseph Swan demonstrated the first working light bulb in 1878 he could never have dreamed that in 2014 we’d be surrounded by super-bright LED screens and lights that could be controlled using mobile phones. Inspired by Alexander Graham Bell, Danielle attempts to beam a special guest into the theatre via hologram using the technology found in a mobile phone. Along the way, Danielle shows the next generation how to hack, adapt and transform the electronics found in the home to have fun and make a difference to the world. This year’s Royal Institution Christmas Lectures have been inspired by the great inventors and the thousands of people playing with technology at their kitchen tables or tinkering in their garden sheds. When Scottish inventor Alexander Graham Bell demonstrated the first telephone in 1876, he could never have dreamed that in 2014 we’d all be carrying wire-free phones in our pockets and be able to video chat in crystal clear HD across the world. Inspired by the Royal Institution’s very own Michael Faraday, Danielle attempts to use simple motors to construct the world’s greatest robot orchestra. Along the way, Danielle shows the next generation how to hack, adapt and transform the electronics found in the home to have fun and make a difference to the world. This year’s Royal Institution Christmas Lectures have been inspired by the great inventors and the thousands of people playing with technology at their kitchen tables or tinkering in their garden sheds. When Michael Faraday demonstrated the first electric motor in 1822, he could never have dreamed that in 2014 we’d be surrounded by mechanical devices capable of performing nearly every human task. 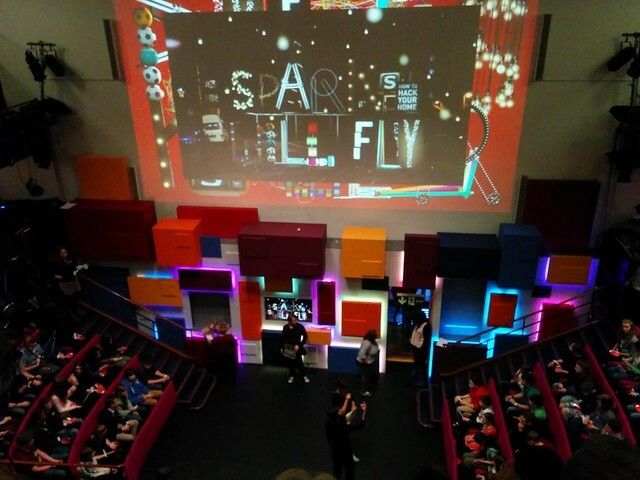 If you miss the television broadcasts, the lectures will also be available on BBC iPlayer for 30 days then at richannel.org/christmas-lectures. This will (probably) be the last post of the year at O’Really, so if you’ve visited, thanks for reading during 2014. Wherever you are, whatever you’re up to, have a Very Makey Christmas and a Hacky New Year in 2015. Peter Wothers lights the blue touchpaper. If you hate Chemistry  it’s probably because your Chemistry teachers weren’t up to scratch. 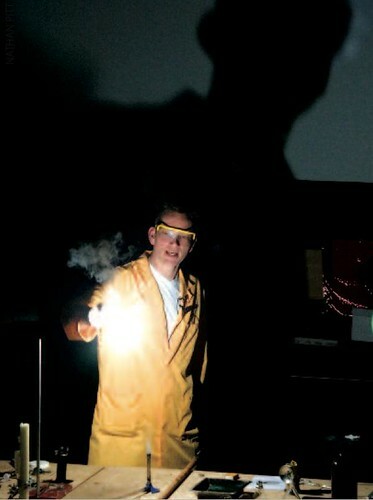 Peter Wothers, The Modern Alchemist, is someone who might rekindle your interest in Chemistry through his delivery of the 2012 Christmas Lectures. Wothers will unpick the chemistry of the world around us, looking at Air, Water and Earth, three of the original Greek ‘elements’ that tantalised alchemists for centuries. He’ll also be exploding and burning things too. Take a deep breath. Inside your lungs is a mixture of highly reactive and incredibly stable gases. Oxygen is the most reactive constituent. When we eat it’s these O₂ molecules that seize electrons from our food to give our bodies the energy to live. Add a third oxygen atom and we make ozone, a gas so reactive that it’s toxic if we breathe it in, but high up in the stratosphere this gas protects us from the sun’s radiation. Add a carbon atom and we produce carbon dioxide, a greenhouse gas responsible for warming the planet. We will unravel the puzzle of how and why these compounds of oxygen hold the key to the viability of life on the planet. Nitrogen, the most common element in air, is an unreactive gas, but a key atom in every cell in every living thing on Earth. How can we imitate nature to bring this suffocating gas alive? Even less reactive are the Noble or inert gases. They’re so stable they are the only elements that exist naturally as individual atoms – but what is it about them that make them so inert? And how can we excite these gases enough to join the chemical party? We’ve come a long way from the days when alchemists thought air was a single element. Water is essential to life since every reaction in our bodies takes place in it. But what makes this fluid so special? What happens when you add a lighted splint to a mixture of hydrogen and oxygen? Kaboom! But why? What makes this particular rearrangement of atoms to form water so explosive? Can we tap this energy release to provide environmentally friendly solution to our energy problems? Plants have the ability to reverse this reaction by using the energy from sunlight to release oxygen from water. We are starting to learn how to do the same. In this lecture we unpack how energy lies at the heart of chemistry. We’ll also look at the salts contained in water. Once again we will see the startling difference between a compound and its constituent elements. Take sodium chloride – aka table salt. Sodium is a soft silvery metal that explodes with water; chlorine a deadly poisonous, choking green gas. Both elements are lethal to us, but after they have met, a dramatic change takes place. The sodium and chloride ions that form are essential components in our bodies. They help generate the electrical impulses that make our brains and nerves work. We begin to see how chemistry plays a vital role in our lives. The rocks that form planet Earth have always fascinated alchemists. Deep in the bowels of the Earth they thought the metals literally grew in the rocks and that one metal over time matured into another. They dreamed of replicating these natural processes turning ‘base metals’ into gold. Today the extraction of minerals and metals from rocks has made fortunes, but not quite in the way the alchemists imagined. We now know many rocks are the result of oxygen combining with different elements – each with individual properties. Breaking the strong bonds between oxygen and these elements has always been a challenge. Humankind learned how to release copper in the Bronze Age, and iron in the Iron Age, through smelting. Now we can extract even more exotic materials. By understanding the properties of materials, such as the silicon present in computers, or the rare earth magnets generating our electricity in wind turbines, we are entering a new era of chemistry in which we can engineer electrons in new configurations for future technologies. We can now put together the unique cluster of protons, neutrons and electrons that form each of the 80 elements in exciting new ways. If the ancient alchemists were alive today they’d be dazzled by the wonders created by the Modern Alchemist. Whatever your favourite element, have yourself a Happy Chemistmas. If you’ve read stuff here at O’Really? in 2012, thanks for visiting and hope to see you again in 2013.